What follows is a series of short reviews of recordings that have arrived in the past month as well as a link to music you might be interested in downloading. Eric Alexander has issued a slew of recordings both as a leader, member of a collective (One For All) and as a sideman in his 2 decades on the "scene.". His big tone, his creativity, and his ability to sound like himself in a musical genre (hard-bop) that has had its share of impressive tenor saxophonists makes his music so approachable. "Don't Follow The Crowd" (HighNote) is yet another strong addition to his discography. It does not hurt one bit that his long-time partner Harold Mabern is at the piano yet again as the Memphis native is one of creative and classiest of people to sit at the keyboard. The rhythm section of Nat Reeves (bass) and One For All partner Joe Farnsworth (drums) is top-notch. My one issue with the CD is all the echo on Alexander's tenor. Other than that, there is a sweet version of Henry Mancini's "Charade" (Mabern's accompaniment is so good) and a lovely take on Michael Jackson's "She's Out of My Life" (really!) that has one of the more graceful solos I have ever heard from Alexander. There are several "burners" starting with the Alexander's "Nomor Senterbress" that opens the program with a catchy melody line (sounds mystical) and his "Remix Blues", a piece with smart chord changes and great cymbal work. This quartet sounds great together (no surprise given their long relationship) and the music is solid but not stolid. One can see sitting in Dizzy's Club Coca Cola or the Jazz Showcase listening to this fine music. To find out more, go to www.ericalexandermusic.com. Best known for his stellar work with Kneebody and his appearances with Ben Allison, David Binney and Pearl Jam, Shane Endsley is a fine trumpeter and has just issued his second CD as a leader. "Then The Other" is the debut CD for Kneebody's Low Electrical Records and features his Music Band. Craig Taborn plays piano (very nicely) alongside bassist Matt Brewer and drummer Ted Poor. Whereas Endsley's work with the Kneebody collective is very high-powered and, to my ears, tightly structured, this session is somewhat "looser" (do not read as "sloppy) and more conversational. The quartet's interactions are pleasing to hear, the rhythm section really pushes many of the pieces along and the solos are quite impressive. Endsley's tone shows the influence of Dave Douglas and Ron Horton; none of these brass-men display blues "roots" but have styles that has elements of Clifford Brown. One hears crisp, clear, lines, not a lot of "smears" but more of a melodic approach. It's fun to hear Taborn alongside Endsley, the way they move through the middle section of "Pedals", holding back, staying on the melody lines or adding quiet colors. There's a touch of rock music and Ben Allison in "Kings County Ramble", notable for Poor's active percussion, Taborn's rippling piano fills and the leader's wide-ranging solo. The title track, an unconventional ballad in form, is quiet throughout, with subtle percussion work (Poor picks up the intensity later on but plays so melodically), minimalist (at times) piano and bass lines that give the piece its depth. The piece unfolds slowly so it's a surprise when the band falls into a steady beat - it does not last very long and feels through-composed, giving the work even more variety. Kneebody bandmate Kaven Rastegar composed "Conditional Love" (the only piece not by Endsley) - it's a pretty ballad that has room for a short piano solo and a really fine bass solo. "Gallery Piece" brings the program to a close, with a romping rhythm and a trumpet solo that heats up in an exciting fashion. Shane Endsley and the Music Band has been touring since the release of the CD and I'm told the interplay of the musicians has gotten stronger, making the music even more exciting. There is so much to like here and one's enjoyment grows with subsequent listens. The leader's work on the slower pieces is measured and musical yet he also displays plenty of fire when pushed by the rhythm section. To find out more, go to kneebody.com/ler/. 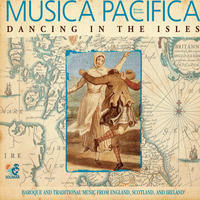 "Dancing in the Isles" (Solimar Records) is the 9th recording by Musica Pacifica, a septet dedicated to the classical and early musics of Europe. This CD, subtitled "Baroque and Traditional Music from England, Scotland, and Ireland", is a joyful reminder that people did not just sit around at the end of a long day. The 33 tracks (just under 75 minutes) range from the 5 "English Country Dances" from the mid-17th Century that open the program to the longer works of Francesco Veracini (1690-1768) and Henry Purcell (1659 - 1695) at the close. In between, one hears a 3-part medley of traditional Scots tunes, a 3-part medley of traditional Irish tunes (arguably the highlight of the CD), 5 tunes that make up "An English Court Masque" (more complicated works that come from theater performances), a Sonata by James Oswald (1710-1769), a 4-part Suite by Matthew Locke (1621, perhaps 1622-1677) and "6 Ayres in G major" by Nicola Matteis. Playing this pleasing, structured and often beautiful music is Judith Linsenberg (recorders, whistle), David Morris (baroque cello, viola da gamba), Charles Sherman (harpsichord), Charles Weaver (baroque, theorbo which is a long-necked lute), Peter Maund (percussion) and baroque violinists Elizabeth Blumenstock and Robert Mealy. Based in the San Francisco Bay area, the septet is known for its extensive repertoire (ranging from Vivaldi to Telemann to the Bachs, J.S., W.F. and C.P.E.) and championing the use of period instruments. No improvisation here but a treasure trove of fine sounds and excellent musicianship. Though the music is certainly "old", Musica Pacifica gives the works its full attention, respect, and has fun bringing the sounds to life. This is dance music - enjoy! For more information, go to www.musicapacifica.org. Dawn of Midi, the creative music trio that issued its debut CD to critical acclaim in 2010 (my review is here), is offering fans a free download of 7 tracks recorded last year on 3 different dates. The trio, composed of contrabassist Aakaash Israni, percussionist Qasim Naqvi, and pianist Amino Belyamani, create music with influences that range from contemporary classical music to improvisational jazz to post-modern rock - what's most impressive is that they already have the own identity and labeling is really futile. Their music takes such fascinating paths, not so much about technical facility (and all 3 are quite good musicians) as in following their muse. Not for the traditional piano trio fan but for the person who likes to be challenged and can go deeper into the music on subsequent listens; Dawn of Midi is giving all listeners the opportunity to judge for themselves. Go to www.dawnofmidi.com/music/ and try the music on.